what do you think, folks? anyone up for some more handprinting swap fun?? signups will be open until friday, june 1st. your swap group details will be sent to you by sunday, june 3rd and the deadline to send your fabric is monday, june 25th, giving you three whole weeks to play around with techniques. 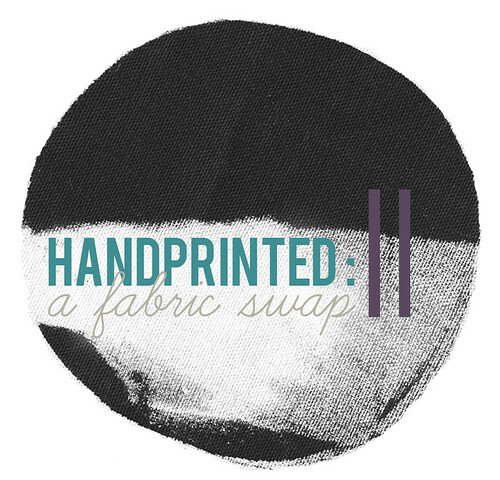 this swap is open to anyone, anywhere in the world, which means if you sign up, you have to be willing to ship fabric overseas (since we'll only be sending fat quarters, you should be able to sandwich your fabric between two pieces of card and send it in a C4 (8.5 x 11inch) envelope to keep postage costs down). This was such good inspiration last time I must make time to join again this time. Thanks Leslie. do you have to have a blog/website? i don't, but would love to play. I love this swap, I would love to join but I just moved and don't know where anything is. I do love the list of tutorials on how to make your own stamps. I will be using those once I can find...anything. I'm so tempted, and very new to this printing world having recently been on a workshop with Lu Summers, will try and sort some essentials out before signing up! What a great idea! I'm signing up! I sent you en e-mail! I am working on my design... so EXCITED! I signed up, can't wait to get going on this! oh, that's embarrassing...just realised this isn't a recent post! oh dear...i do need sleep! lots of fun; but alas I'm too late....next year I'm in! Fabric like hard weaved ones have been increasing in usage for many fashion shows. They call them pull up banner that have patterns and embroidery. I find them exquisite. Hand-printed fabric material can be a good seat cover for my car. Can anyone has an idea on how I should start it? Thanks!